Secure Your Devices With Inventive IT Services Pvt.Ltd. Is your computer is slower than a snail? Is your computer slowing down? Do you want to find it easier to move a mountain than multitasking on your machine? Then Inventive IT Services Pvt.Ltd. is offering you the opportunity to grab an advantage of Quick Heal Anti -virus With Total Security. 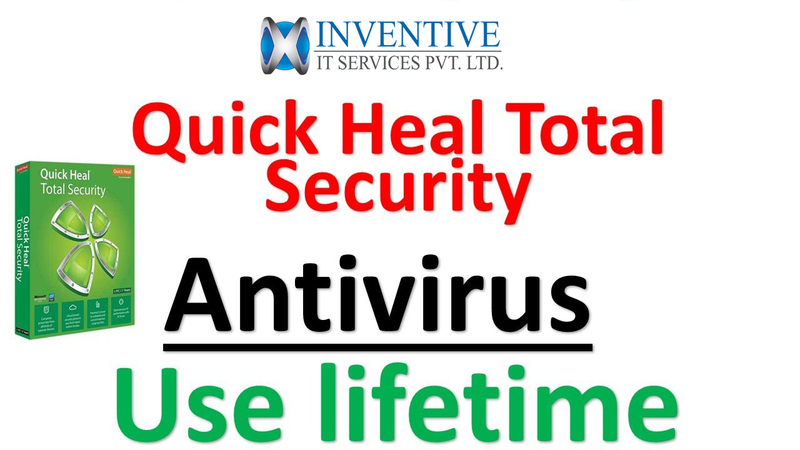 Quick Heal Technologies is the pioneer of antivirus research and development in India and has set the benchmark of computer security standards. Quick Heal security solutions provide comprehensive security through rapid technological upgradation and product customizations. ü Core Protection: Assures complete security for your PC with a deep system scan. ü Malware Protection: The existing Malware Protection of Quick Heal is now enhanced and offers more protection to your PC against spyware, adware, keyloggers, riskware, and other malicious programs. ü Anti-Keylogger: Efficiently prevents programs called keyloggers from recording what you type on your keyboard while you are doing online banking or shopping or simply browsing the Internet. ü Web Security: Automatically detects unsafe and potentially dangerous websites, and prevents you from visiting them. ü Email Security: Efficiently blocks emails that might carry infected attachments or links to compromised or fake and phishing websites. ü Safe Banking: Protects your online banking activities from fraudulent websites and malicious programs that steal financial information. ü Enhanced Self-Protection: Protects Quick Heal's running processes and services. ü Parental Control lets you manage and control Internet and computer access for your kids. ü Quick Heal Remote Device Management (RDM): This is a free portal where you can add your Quick Heal enabled device, view its current status, and get notified of any critical situation such as malware infections.